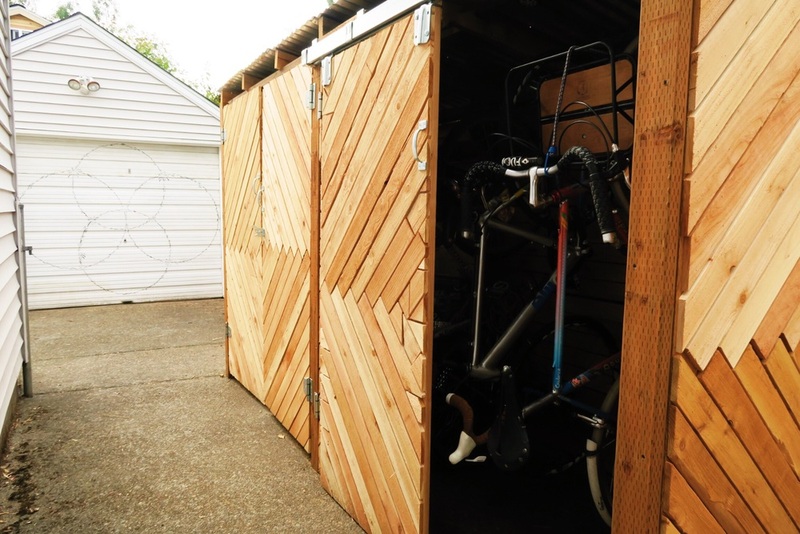 One of the first projects we tackled at The Klum House is building a bike shed to park the two cargo bikes: The Bilenky & The Cleaver and our everyday commuters: The Merckx, the Daccordi, and The Cinelli (Now The Elle). The ideal goal was to build a bike parking shed that could actually fit all our bikes, but that was a lofty goal. Really, we needed to build something to work within the confines of what wood was actually laying around the yard (re-used from an old storage shed demolition). The wood that Dustin used to make the mosaic was cedar planks procured off of Craigslist. We started by working off of reference we got on Pinterest, which I am obsessed with. It is a particularly useful tool for collaborating on projects with other artists/makers where you need to come to a visual agreement. (Email me if you want to see what reference we used). One of the design confines was that we wanted the bike shed to fit in our driveway without making the walkway too narrow. We also wanted the shed to be able to catch rain water (next phase of project). I drew the plans for the bike shed & cut the 4 x 4's for the skeleton of the structure. 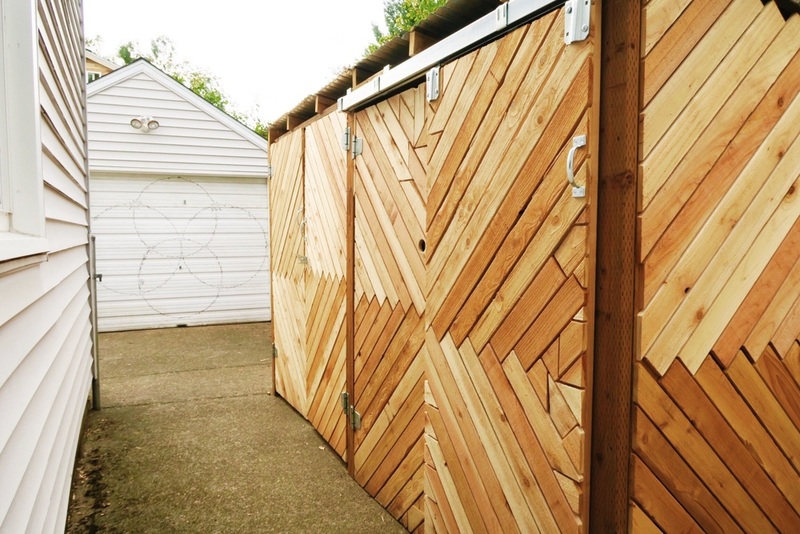 Dustin built most of the shed, along with the beautiful mosaic wood siding. If you want a copy of our plans, download a free PDF of them here. I can't promise they will be complete, since we might have veered off our plan, but they will definitely get you started! You can also email me with questions. The mosaic wood pattern that Dustin used for the Bike Shed wood siding was actually inspired by this door that I built for the tool shed in The Student Organic Garden at UC Berkeley.